There are several data bundles and shell scripts that cover most of VDJtools usage scenarios available in the examples repository. All of the examples refer to a folder with clonotype abundance tables (samples/). They contain a sample metadata file (metadata.txt, see Metadata) and a shell script run.sh that contains a line-by-line instructions to run various VDJtools routines. Sections below give a detailed explanation for post-analysis steps for the available example datasets. For more details on individual VDJtools routines see the Analysis modules section. Samples in the repository are already converted to VDJtools format. # sample clustering is performed on this stage. The code block above shows example usage for nearly all available commands. 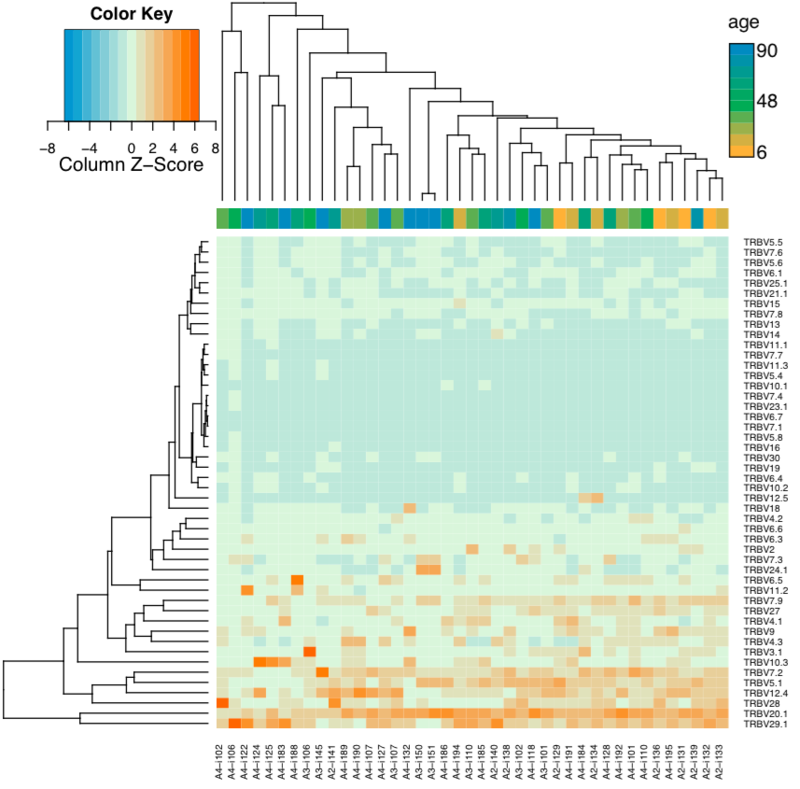 Rarefaction plot in the aging case displays a strong age-related diversity decrease. If running on a server with ~24GB of available RAM one can try out repertoire clustering for the whole experiment (replace metadata.small.txt with metadata.txt for corresponding routines) which will show some interesting age-related trends. Variable segment usage in healthy donors of various age. Note non-random sample grouping within dendrogram which can be attributed to stochastic antigen-driven expansion of clonotypes as we age. See CalcSegmentUsage for a detailed description of this plot. 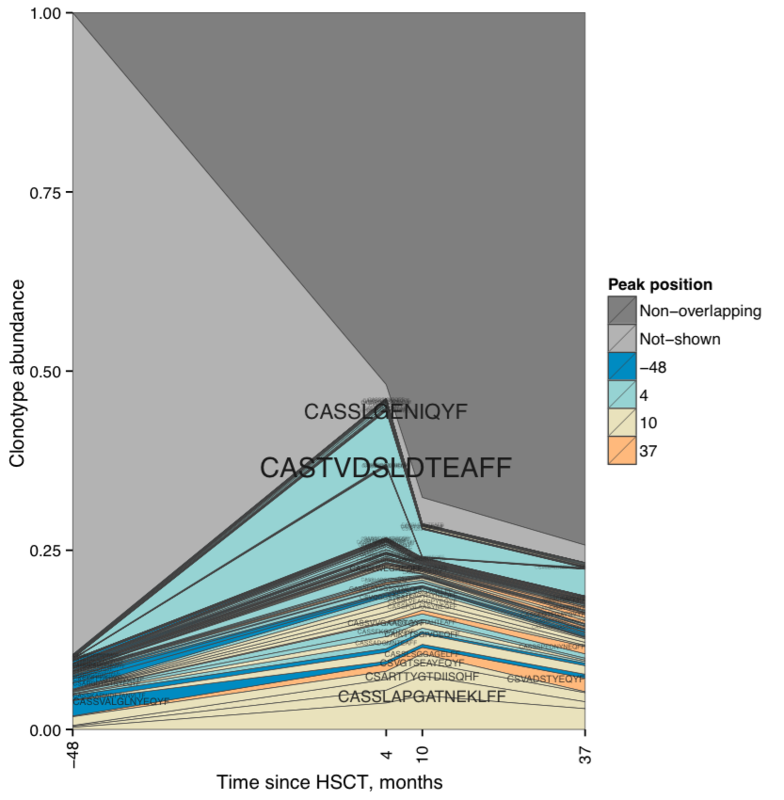 RarefactionPlot output shows how repertoire diversity is lost and restored during post-HSCT period. The output of ScanDatabase (DEPRECATED since v1.0.5, use VDJmatch) displays that CMV- and EBV-specific clonotypes start to dominate in the repertoire: they comprise ~4% of repertoire prior to HSCT, but increase more than 2-fold in post-HSCT period. Clonotype abundance plot. Stacked abundance for top 100 clonotypes at different time points is shown. MS is a complex autoimmune disorder that does not show a strong T-cell clonotype bias (see Turner et al.). Still some high-level repertoire features such as diversity and segment usage are distinct between affected persons and healthy donors. Below is an example of RarefactionPlot graphical output. Rarefaction analysis of MS and healthy donor repertoires. Note that rarefaction curves for MS patients are generally lower than those for healthy donors, indicating the presence of clonal expansion in former.